New York Times bestselling author Dorothea Benton Frank is back home in the Carolina lowcountry, spinning a tale that brims with the warmth, charm, heart, and humor that has become her trademark. 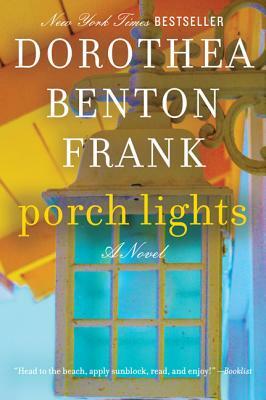 Porch Lights is a stirring, emotionally rich multigenerational story—a poignant tale of life, love, and transformation—as a nurse, returning to Sullivans Island from the Afghanistan War, finds her life has been irrevocably altered by tragedy…and now must rediscover love and purpose with the help of her son and aging mother. An evocative visit to enchanting Sullivans Island with its unique pluff mud beaches, palmetto trees, and colorful local lore—a novel filled with unforgettable characters, and enlivened by tales of the notorious Blackbeard and his bloodthirsty pirate crew and eerie Edgar Allan Poe stories—Porch Lights stands tall among the very best works of not only Dottie Frank, but Anne Rivers Siddons, Rebecca Wells, Pat Conroy, and other masters of the modern Southern novel as well.